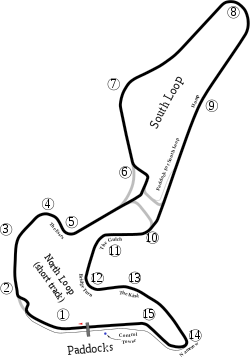 Circuit Mont-Tremblant (French pronunciation: ​[siʁkɥi mɔ̃ tʁɑ̃blɑ̃]) is a 4.26 km (2.65 mi) race circuit about 13 km (8.1 mi) south of the village of Mont-Tremblant, Quebec, Canada. The name of the village of Saint-Jovite was often included in the name of the circuit, but since the village was amalgamated into Mont-Tremblant in the year 2000, it is no longer considered or functions as an independent entity. The first two sections of the circuit were built in 1964 and extended by another mile into September 1965. The extension featured long straights and by virtue of the terrain, a small hill. Nicknamed "the Hump" it gained legendary status during the inaugural 1966 Can Am race. Two drivers in practice found that their cars, both near identical Lola T70 CanAm cars, launched themselves into the air. Both drivers emerged unhurt but were unable to compete in the race. The Canadian winters quickly rendered the track surface very bumpy and as a result, the attrition rate was quite high in the two Canadian Grand Prix Formula One events staged at the circuit. Of the 40 cars entered in those two races (20 each, in 1968 and 1970), 21 reached the checkered flag (with only 16 classified – the rest finishing too far behind the race winners). The Control Tower and start-finish straight, looking west against the flow of the circuit, towards the Namerow corner. The track complex was purchased by Montreal-based fashion mogul Lawrence Stroll in 2000, who tapped track architect Alan Wilson to redesign the circuit, with the aim of modernizing its safety features in accordance with current FIA regulations. The resulting redevelopment forced the park to close for the entire 2000 and 2001 racing seasons. A major overhaul of the circuit in 2004 allowed more domestic and continental sportscar races to be held. Pit road was lengthened and widened featuring a new pit exit, while the pit straight was widened to 12 m (39.4 ft). A chicane was added in Turn 2, while Turns 6 and 10 were modified to create two separate circuits which could be run simultaneously. The signature hump was lowered 3.5 metres (11.5 ft) for safety, while Namerow corner was modified for additional runoff. The track features 28 metres of elevation change. On July 1, 2007, Mont-Tremblant hosted a round of the Champ Car World Series, marking the series' first race at the circuit since Indy cars competed there in 1967 and 1968, when Mario Andretti won all four races. The race featured many lead changes and ended in wet weather, with Robert Doornbos emerging victorious. In this race, French driver Tristan Gommendy set the track record, with a time of 1.16.776 in a Panoz DP01. ^ "Canadian-American Challenge Cup 1966". Archived from the original on 2008-06-02. Retrieved 2008-01-14. ^ a b "Mont-Tremblant". www.grandprix.com. Retrieved 21 December 2007. ^ "Circuit Mont-Tremblant". www.na-motorsports.com. Retrieved 21 December 2007. ^ "Circuit Mont-Tremblant Events". Le Circuit Mont-Tremblant. Archived from the original on 2007-04-15. Retrieved 2013-05-05. ^ "1968 Trans-Am Box Scores" (PDF). SCCA Archives. Retrieved 2013-05-02. ^ "1969 Trans-Am Box Scores" (PDF). SCCA Archives. Retrieved 2013-05-02. ^ a b "1970 Trans-Am Box Scores" (PDF). SCCA Archives. Retrieved 2013-05-04. ^ "1971 Trans-Am Box Scores" (PDF). SCCA Archives. Retrieved 2013-05-04. ^ "1977 Trans-Am Box Scores" (PDF). SCCA Archives. Archived from the original (PDF) on 2012-07-16. Retrieved 2013-05-04. ^ "1978 Trans-Am Box Scores" (PDF). SCCA Archives. Archived from the original (PDF) on 2012-04-24. Retrieved 2013-05-04. ^ "SCCA US Road Racing Championship race". ultimateracinghistory.com. Retrieved 2013-05-05. ^ "St Jovite Grand Prix". oldracingcars.com. Retrieved 2013-05-05. ^ "Le Circuit Continental". oldracingcars.com. Retrieved 2013-05-05. ^ "1975 CASC Player's Challenge Series". champcarstats.com. Retrieved 2013-05-05. ^ "1976 CASC Player's Challenge Series". champcarstats.com. Retrieved 2013-05-05. ^ "2007 Cooper Tires Presents the Champ Car Atlantic Championship Powered by Mazda". champcarstats.com. Retrieved 2013-05-05. ^ "2008 Cooper Tires Presents the Atlantic Championship Powered by Mazda". champcarstats.com. Retrieved 2013-05-05. ^ "6 h Mont Tremblant". World Sports Racing Prototypes. Archived from the original on 2008-10-12. Retrieved 2013-05-05. ^ "Circuit Mont-Tremblant". Ultimate Racing History. Retrieved 25 March 2013. Wikimedia Commons has media related to Circuit Mont-Tremblant. This page was last edited on 28 February 2019, at 01:49 (UTC).